When it comes to paying off student loan debt, sometimes you have to get a little creative. That’s exactly what Jeremy Kalgreen did. He turned his T-shirt designs into major bucks to pay off his debts. After graduating with an art degree, Kalgreen had $15,000 in debt. Even though he hated being in debt, working at a photo lab and delivering pizza weren’t doing much to reduce his 10-year loan. Since he’s an artist, he said he tries to learn a new skill each summer. So one summer, he tried learning silk screening for t-shirts. That experiment didn’t go so well, but it did help him discover that he loved designing t-shirts. He designed a few shirts to add to his wardrobe and uploaded them on to Spreadshirt.com. At this point, he had no intention of creating a successful business. He just wanted to wear his own designs. As fate would have it, his car broke down, and he was unable to pay the $90 to have his shirts printed. He decided to make his designs public on the site with the hope he might make a small amount of money. The orders came in almost immediately. Then Kalgreen started making $300 a month. Before he knew it, blogs started mentioning his designs and business started to boom. He expanded his t-shirt design business to his own website, WearScience.com, and now designs and sells t-shirts full-time. 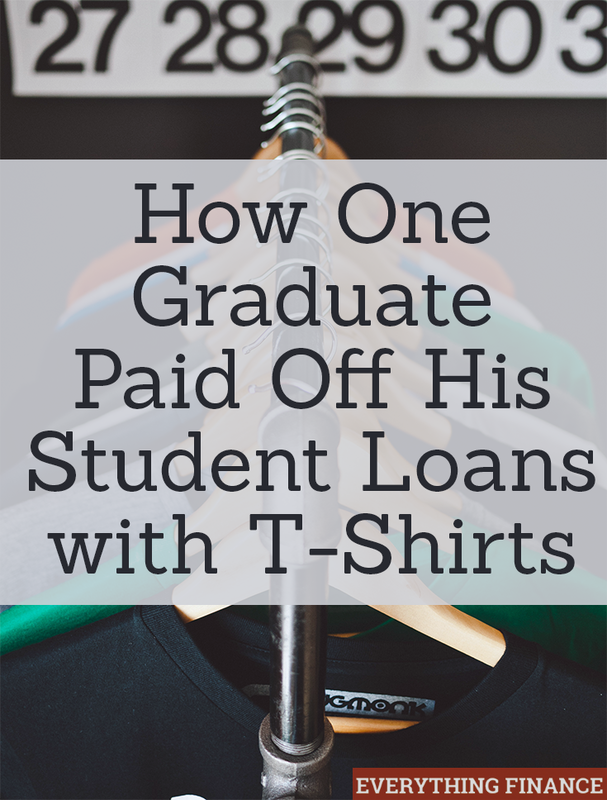 It took him two years to pay off his student loan debt as his business grew. In the beginning stages, he continued to live like a college student. He lived with several roommates and kept his living costs down. Kalgreen knew that sales could drop any moment, and he didn’t want to find himself in debt again. Now his t-shirt business is well-established and successful. He was able to start a family and buy a house, and his student loans are a thing of the past. It’s important to remember that Jeremy Kalgreen not only had a great business idea that helped him pay off debt, but he also lived frugally, too. Extra income will not benefit your student debt repayment if you increase your cost of living. Are you earning extra to accelerate paying off your student loans? How are you doing it?